Fall: It’s the best season to get outdoors, pick fresh produce, and enjoy family-friendly events. Whether you’re enjoying the vibrant foliage or sipping on some mulled cider, there’s endless fun to be had in New Jersey. One of the best ways to get you and your family in the spirit is by taking a trip to local farms and wandering through a corn maze. Here are our favorites in the state! Talk about fall fun jam-packed into one awesome event! Delaware River Railroad Excursions take guests along a train ride to old Snyder farm, where after alighting, guests will find a large corn maze with two games scattered throughout the maze. In addition, there is the Ol’ Susquehanna Mine on-site, which you can visit and pan for real gem stones. Bring along a picnic to enjoy along the Delaware or Lehigh River to conclude the scenic day before making your way back to your car via a trip on the railroad. The corn maze at the Farm in Harmony has a military theme this year, to support all past, present, and future military personnel. The theme this year is the Purple Heart, and opening weekend for the corn maze features the special event, “bring your hero.” Continuing on the theme of supporting veterans and active military, a discounted entry price of $5 is offered for veterans and admission is free if you have ever been deployed. Try to plan your visit for a Saturday (the maze is open Wednesdays through Sundays) so that you can pick up handmade soaps and other gifts at the Farm Shoppe. Owned and run by the County of Mercer, Howell Farm has the longest running corn maze in New Jersey. The corn maze is four acres with two miles of paths to get lost along. 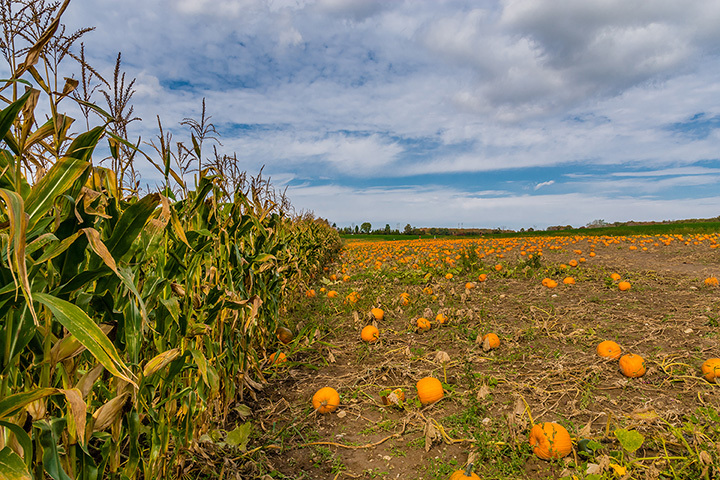 In addition to the corn maze fun, there are also other activities on-site including a pumpkin patch, hayrides, food, and a mini maze for little kids. Howell Farm also offers numerous events throughout the year such as farm story time for kids. A twist on the family-favorite board game Monopoly, get ready for fun at Happy Day Farm’s Maize-O-Poly, where participants can search for squares to put on their Maize-O-Poly game board. This 10-acre corn maze promises fun and a bit of friendly competition with the addition of the game. If you’d like to learn witty facts while in the corn maze, you can also text their “corn master,” who will reply and perhaps provide you with clues for which way to turn! This year, the theme of the corn maze is “100 Years of John Deere.” This corn maze is open on weekends only from mid-September to late October. Lupardi’s Nursery creates and hosts a fun fall festival. Open seven days per week, swing by Lupardi’s for mums, pumpkins, and gourds or come on the weekend to shop and enjoy the events. On-site you can take part in wagon rides, slide down a 30-foot treehouse, or try to find your way through a six-acre corn maze. There is also a snack stand serving apple cider, doughnuts, and hot pretzels. In addition, there are alpaca, sheep, goats, and pigs that you and your kids can feed or pet. The family-owned Etsch Farms features so much fall fun for families. Each fall, the farm creates an eight-acre corn maze with a new theme and challenging twists and turns. Stay tuned to see what the theme will be! Also during the festival are hayrides, a pumpkin patch, and farm animals. In addition, taste the freshly made apple cider donuts and pie. The corn maze runs on the weekends from September through October. This massive 10-acre corn maze is open on weekends from late September through late October. Open till late, Lentini Farms encourages you to bring your own flashlight at night, which is a fun way to experience an already challenging maze. In addition to the corn maze, there is also a haunted hayride open in the evenings. While visiting, also enjoy the pumpkin patch and farm animals. Each year on September 1, Stony Hill Maze Fun Park opens a 10-acre corn maze, and this year the maze’s theme is the “Age of Edison” in celebration of Thomas Edison’s inventions. Within the maze are challenges and games, so you can learn about the overall theme. In addition, Stony Hill Maze Fun Park also has a mini maze for children, a rope maze, tile maze, hayrides, and pick your own apples and pumpkins. Fairfield Farms encourages families to spend the weekend outdoors and has made it oh so fun with their family-friendly events. It has organized hayrides, pumpkin picking, a rope maze, and a five-acre corn maze. The corn maze here is child-friendly and little kids will enjoy an indoor hay obstacle course. Also at Fairfield Farms, you’ll find a slide, farm animals, and a selection of fall food and beverages such as mulled cider, and apples. Ort Farms is a local family-owned farm that offers a farm stand and an excellent CSA program. Ort Farms has a corn maze that has been designed to honor veterans and active military personnel. Swing by the farm stand after working up an appetite getting lost in the maze to enjoy freshly made doughnuts and pies. View more New Jersey Corn Mazes.